While applying for a job as an administrative assistant, applicants often require a cover letter to attach to their resumes. To make the process of drafting the cover letter easy, we have a wide range of ready to use cover letters for administrative assistants to choose from. These Sample Letters are free of cost, available in a variety of formats and are also printer-friendly. Here’s a list of the available cover letters for users to choose from. 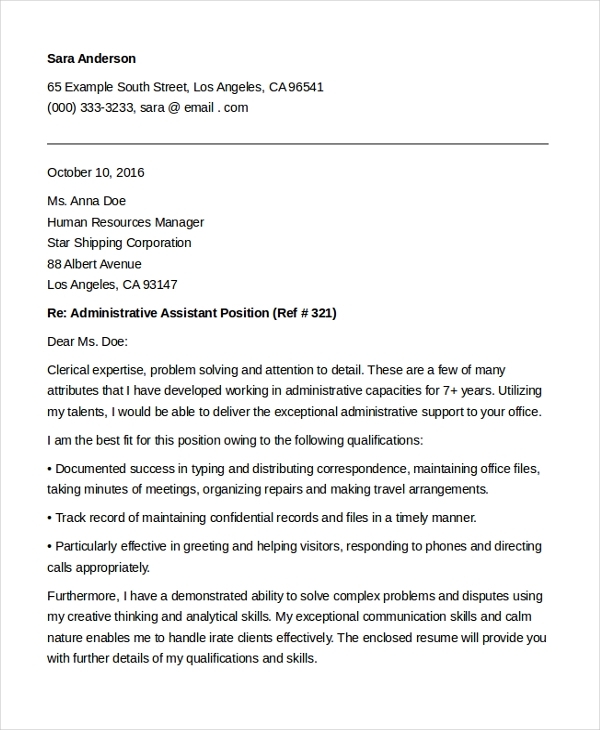 The sample cover letter for administrative assistant has space for the user to add his name, address, contact information and other details. This template is a sample and has guidelines on how to draft the cover letter. 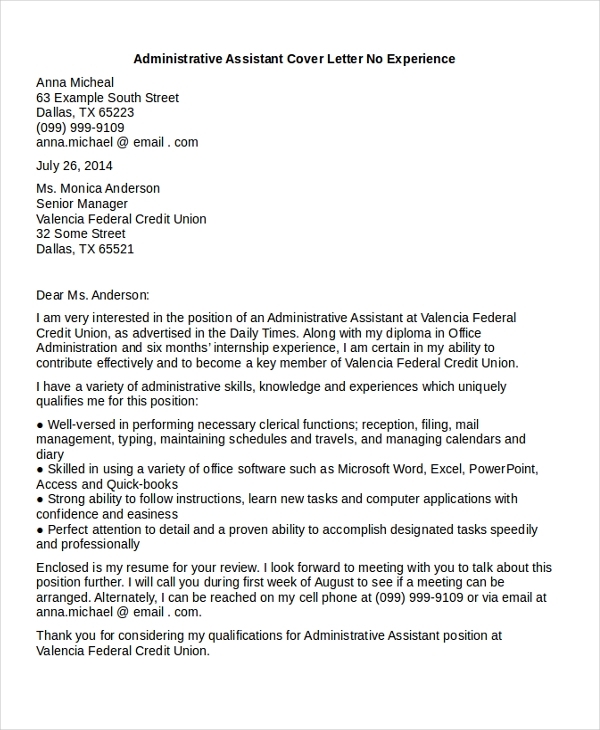 The administrative assistant cover letter can be attached to the applicant’s resume. 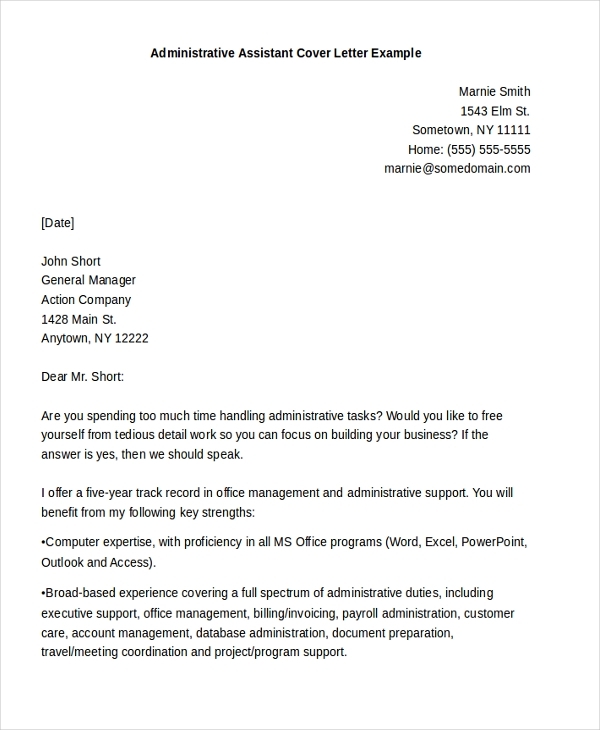 This sample letter has space for the user to add details of his personal information, skills, educational background and other relevant data. 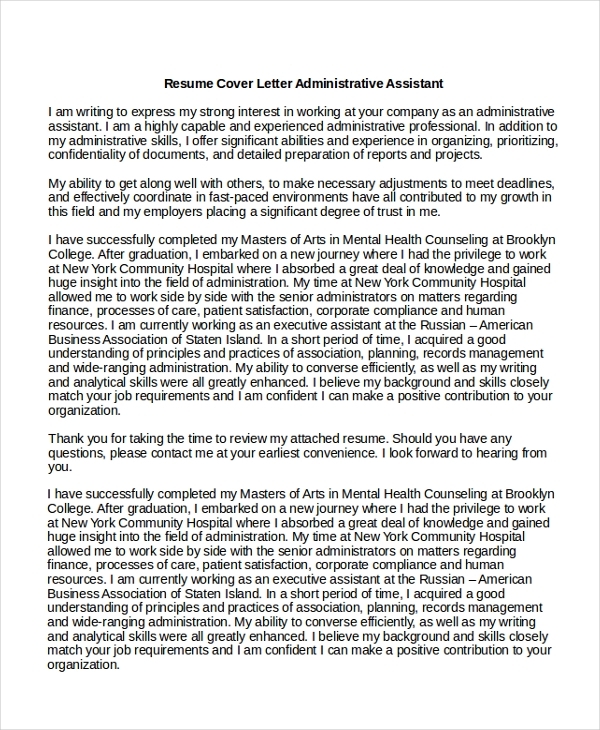 You may also see Resume Cover Letter Examples. The resume cover letter administrative assistant template has multiple cover letter samples for the user to choose from. The sample letters can be copied, pasted and edited as per the specifications and requirements of the user. The administrative assistant cover letter is ideal for applicants who have no work experience in the past and are applying for their first jobs. This letter can be copied, pasted and edited to suit the requirements of the user. 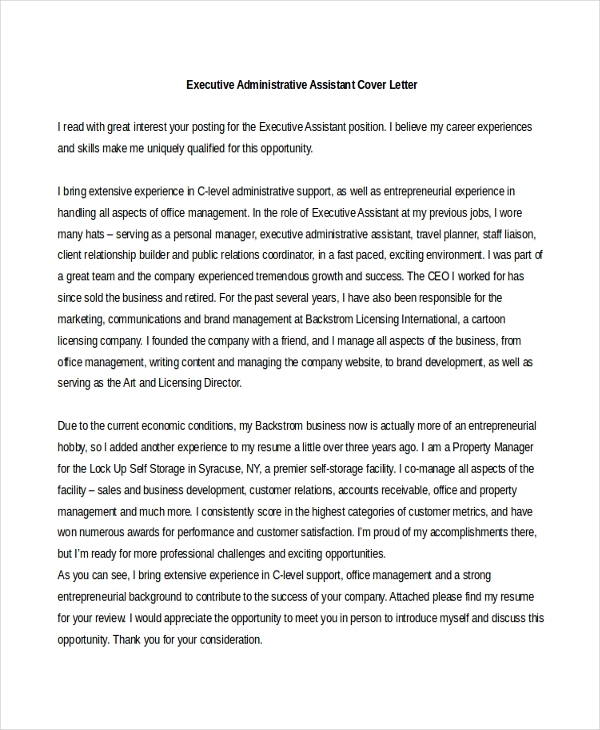 The executive administrative assistant cover letter has multiple sample letters for the user to choose from. Executive assistants applying for new jobs will find these sample cover letters extremely useful and handy. You can also see Teacher Cover Letters. The entry-level administrative assistant cover letter is best suited for fresh graduates who are applying for their first jobs. The user can edit this sample letter and add details of his personal information, educational qualifications, and other relevant data. The executive administrative assistant cover letter example has a wide range of cover letters to choose from. 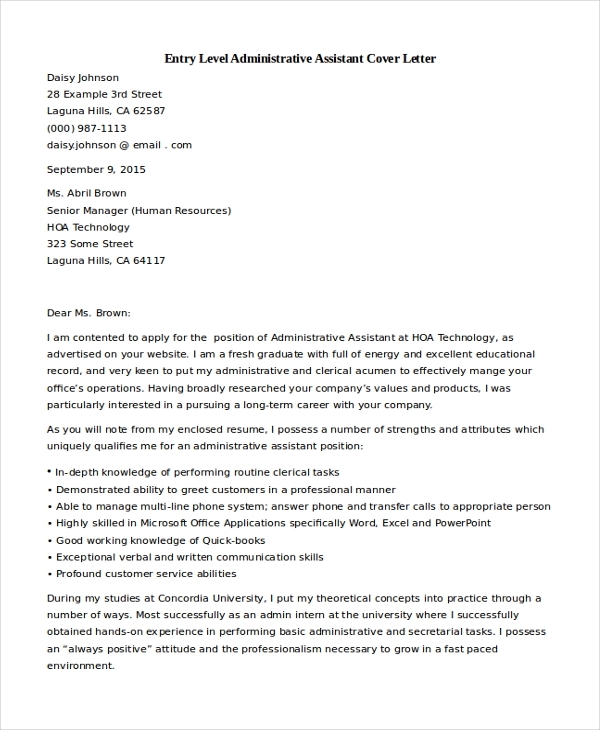 The user can choose and attach one of these professionally drafted cover letters to his resume when applying for a new job. 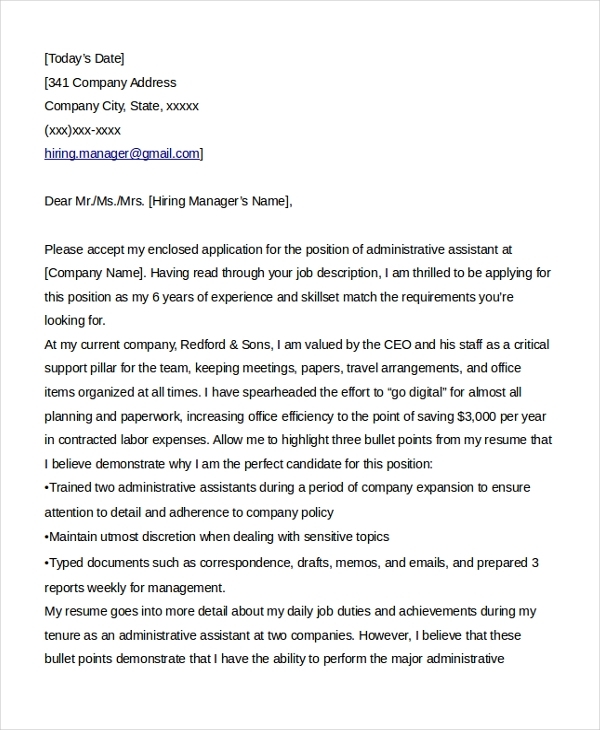 The cover letter for the administrative assistant job is a printer-friendly and easily editable sample letter that the user can add to his resume when applying for a new job. Job applicants who are submitting their resumes to prospective business organizations and firms can use the cover letters. Entry-level candidates, experienced candidates, recently graduated applicants and interns can all use these sample cover letters in their job applications. You may also see Administrative Assistant Cover Letters. Even individuals who are uploading their resumes on job portals can attach these professionally drafted cover letters to their CVs. Ideally, this range of cover letters is best suited for those applying for the position of an administrative assistant. 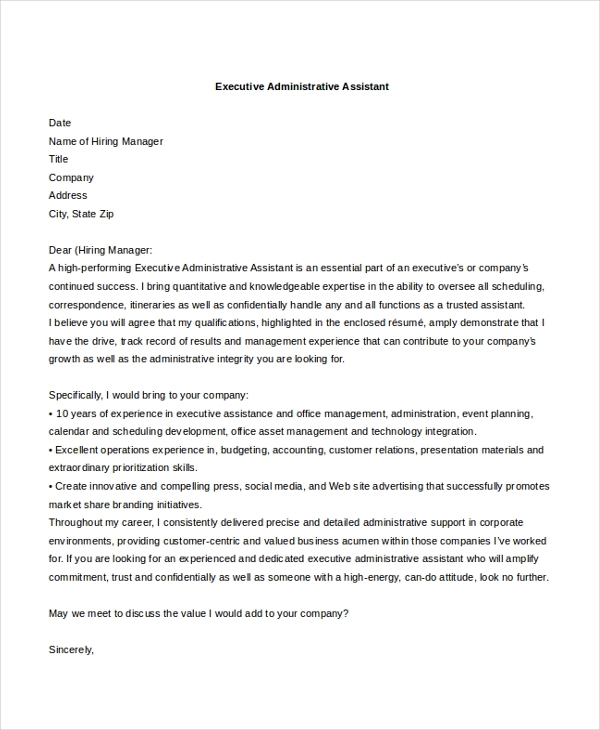 So, if you’re looking to apply for the job of an administrative assistant and you need to submit your resume to the HR department of a firm, attaching one of these cover letters to your resume is highly recommended. You can also see Formal Letter Formats. What Are The Benefits of These Cover Letters? Using these cover letters can have a variety of benefits. First and foremost is that they are professionally drafted and can be used by entry-level applicants who may have difficulties in drafting a cover letter from scratch. Secondly, using the cover letters can be beneficial because attaching these letters to a resume gives a good impression of the applicant to the interviewer or the prospective employer. Lastly, the cover letters are beneficial because they are absolutely free of cost, easy to edit and can also be saved and re-used for future job applications. You may also see Sample Reference Letters. So, if you’re looking for a well-drafted cover letter to add to your resume, you have come to the right place. Just select one that best that suits your requirement from the above-mentioned list, edit it, print it out and attach it to your resume. We guarantee you that with these sample cover letters, your interviewer won’t be disappointed.